Cannabis has been demonstrated to have bronchodilator, anti-inflammatory, and antitussive activity in the airways, but information on the active cannabinoids, their receptors, and the mechanisms for these effects is limited. We compared the effects of Δ9-tetrahydrocannabinol, cannabidiol, cannabigerol, cannabichromene, cannabidiolic acid, and tetrahydrocannabivarin on contractions of the guinea pig–isolated trachea and bronchoconstriction induced by nerve stimulation or methacholine in anesthetized guinea pigs following exposure to saline or the proinflammatory cytokine, tumor necrosis factor α (TNF-α). CP55940 (2-[(1R,2R,5R)-5-hydroxy-2-(3-hydroxypropyl) cyclohexyl]-5-(2-methyloctan-2-yl)phenol), a synthetic cannabinoid agonist, was also investigated in vitro. The cannabinoids were also evaluated on TNF-α– and lipopolysaccharide-induced leukocyte infiltration into the lungs and citric acid–induced cough responses in guinea pigs. TNF-α, but not saline, augmented tracheal contractility and bronchoconstriction induced by nerve stimulation, but not methacholine. 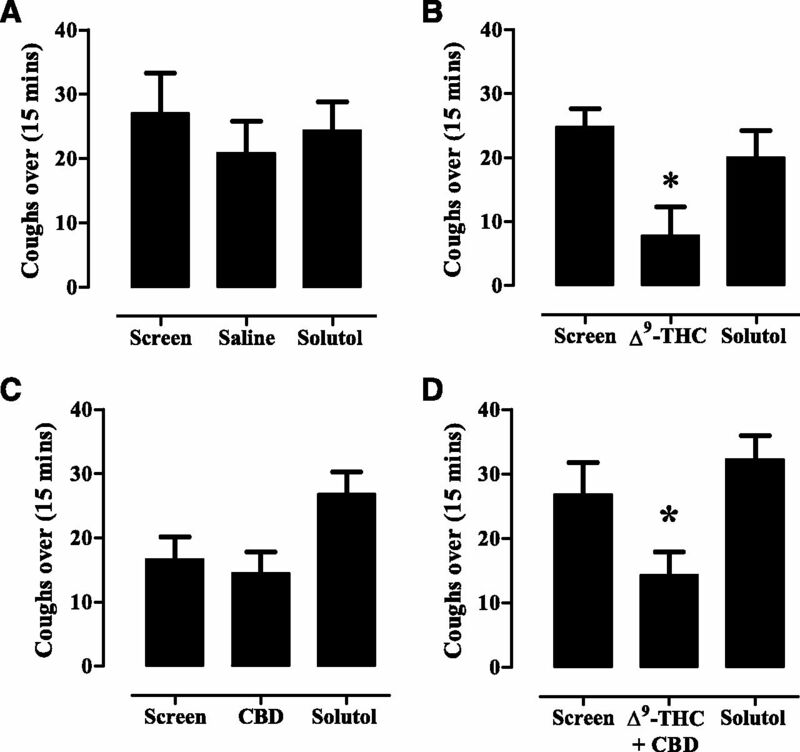 Δ9-Tetrahydrocannabinol and CP55940 reduced TNF-α−enhanced nerve-evoked contractions in vitro to the magnitude of saline-incubated trachea. This effect was antagonized by the cannabinoid 1 (CB1) and CB2 receptor antagonists AM251 [N-(piperidin-1-yl)-5-(4-iodophenyl)-1-(2,4-dichlorophenyl)-4-methyl-1H-pyrazole-3-caroxamide] and JTE907 [N-(1,3-benzodioxol-5-ylmethyl)-1,2-dihydro-7-methoxy-2-oxo-8-(pentyloxy)-3-quinolinecarboxamide], respectively. Tetrahydrocannabivarin partially inhibited the TNF-α−enhanced nerve-evoked contractions, whereas the other cannabinoids were without effect. The effect of cannabidiol and Δ9-tetrahydrocannabinol together did not differ from that of the latter alone. Only Δ9-tetrahydrocannabinol inhibited TNF-α−enhanced vagal-induced bronchoconstriction, neutrophil recruitment to the airways, and citric acid−induced cough responses. TNF-α potentiated contractions of airway smooth muscle in response to nerve stimulation by enhancing postganglionic acetylcholine release. 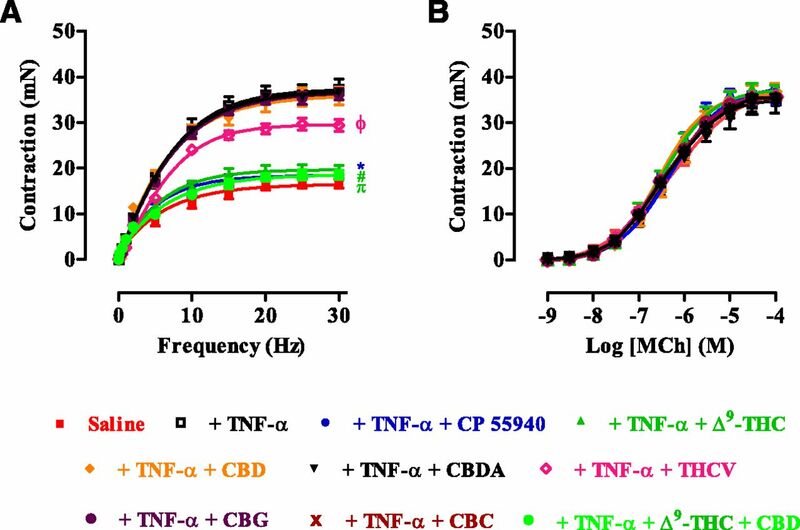 Δ9-Tetrahydrocannabinol and CP55940 inhibited the TNF-α−enhanced acetylcholine release, and hence contraction and bronchoconstriction, through activation of presynaptic CB1 and CB2 receptors. The other cannabinoids did not influence cholinergic transmission, and only Δ9-THC demonstrated effects on airway hyper-responsiveness, anti-inflammatory activity, and antitussive activity in the airways. The Cannabis sativa plant has been valued since ancient times for its medicinal and psychotropic properties. Despite its present classification as a controlled substance in the majority of the Western world, reports on the use of herbal preparations of the plant for recreational and self-medication purposes have implicated the effectiveness of extracts of the plant in the treatment of a variety of ailments, including asthma and cough (O’Shaughnessy, 1842; van Hoozen and Cross, 1997; Iversen, 2000). Botanical preparations of the cannabis plant and certain plant-derived cannabinoids have been evaluated for their bronchodilator (Vachon et al.,1973; Tashkin et al., 1974, 1975, 1977; Williams et al., 1976; Hartley et al., 1978; Grassin-Delyle et al., 2014), anti-inflammatory (Jan et al., 2003), and antitussive (Gordon et al., 1976) activity in subjects with asthma and in experimental animals. However, because of local irritation of the airways caused by constituents of the cannabis smoke, the poor bioavailability of the plant components following oral administration, and the intoxication caused by Δ9-tetrahydrocannabinol [Δ9-THC; (−)-(6aR,10aR)-6,6,9-trimethyl-3-pentyl-6a,7,8,10a-tetrahydro-6H-benzo[c]chromen-1-ol], the major pharmacologically active component of cannabis, the medicinal use of cannabis for treatment of inflammatory and respiratory diseases has been hampered (Shapiro et al., 1977; Tashkin et al., 1977). In contrast to the extensive research that has been carried out on the respiratory consequences of cannabis smoking, e.g., pulmonary carcinoma and inflammation (van Hoozen and Cross, 1997), very limited information is available with respect to the mechanism by which the pharmacologically active cannabinoids of the plant may influence the underlying phenotypic changes of the airways observed in patients with asthma. Recent studies in airways have primarily focused on the effects of the synthetic cannabinoid receptor agonist WIN 55212-2 [(R)-(+)-[2,3-dihydro-5-methyl-3-(4-morpholinylmethyl)pyrrolo[1,2,3-de]-1,4-benzoxazin-6yl]-1-naphtahlenylmethanone mesylate], and to a lesser extent on the endogenous cannabinoids, e.g., anadamide (Calignano et al., 2000; Jan et al., 2003). For example, WIN 55212-2 has been demonstrated to suppress the bronchospasm in guinea pigs in vivo evoked by capsaicin (Calignano et al., 2000), and in vitro, this cannabinoid has been found to inhibit the cholinergic and nonadrenergic, noncholinergic constriction of the human, rat, and guinea pig airway smooth muscle evoked by electrical field stimulation (EFS) (Yousif and Oriowo, 1999; Yoshihara et al., 2004, 2005a,b; Grassin-Delyle et al., 2014), the airway hyper-responsiveness induced by nerve growth factor (de Vries et al., 2001), and extravasation of plasma proteins into the airways induced by ovalbumin in allergic guinea pigs (Fukuda et al., 2010). Furthermore, WIN 55212-2 has also been shown to inhibit capsaicin-evoked sensory nerve depolarization in the human- and guinea pig–isolated vagus nerve (Patel et al., 2003) and suppress capsaicin- and citric acid–induced cough responses in guinea pigs in vivo (Calignano et al., 2000; Morita and Kamei, 2003; Patel et al., 2003). All these protective effects appear to involve a downregulation of sensory nerve excitability through a putative action at either the cannabinoid 1 (CB1) or CB2 receptor, but not both, depending on the experimental model used. Although these data are invaluable, our understanding of the pulmonary pharmacological effects of the large number of phytocannabinoids that are present in the cannabis plant is limited. Therefore, we have sought to evaluate six of the most abundant cannabinoids in the cannabis plant, i.e., Δ9-THC, cannabidiol (CBD; 2-[(1R,6R)-6-isopropenyl-3-methylcyclohex-2-en-1-yl]-5-pentylbenzene-1,3-diol), cannabigerol (CBG; 2-[(2E)-3,7-dimethylocta-2,6-dienyl]-5-pentyl-benzene-1,3-diol), cannabichromene [CBC; 2-methyl-2-(4-methylpent-3-enyl)-7-pentyl-5-chromenol], cannabidiolic acid [CBDA; (1′R,2′R)-2,6-dihydroxy-5′-methyl-4-pentyl-2′-(prop-1-en-2-yl)-1′,2′,3′,4′-tetrahydro-[1,1′-biphenyl]-3-carboxylic acid], and tetrahydrocannabivarin (THCV; 6,6,9-trimethyl-3-propyl-6a,7,8,10a-tetrahydro-6H-benzo[c]chromen-1-ol), for their ability to influence airway hyper-responsiveness, airway inflammation, and cough in guinea pigs exposed to the proinflammatory cytokine tumor necrosis factor α (TNF-α) or the protussive agent citric acid using methodology described elsewhere (Venkatasamy et al., 2010; Makwana et al., 2012a). To aid in the interpretation of data obtained with the plant-derived cannabinoids, some experiments were also performed using the nonselective synthetic cannabinoid receptor agonist CP55940 (2-[(1R,2R,5R)-5-hydroxy-2-(3-hydroxypropyl) cyclohexyl]-5-(2-methyloctan-2-yl)phenol). Preliminary accounts of some of these data have been communicated to the American Thoracic Society (Makwana et al., 2012b). All animal care and experiments complied with the requirements of the UK Animals (Scientific Procedures) Act 1986 and were approved by the King’s College London ethics committee. Male adult Dunkin-Hartley guinea pigs (250–350 g) were used from stock originating at B&K Laboratories (Hull, UK). The animals were housed in rooms with a controlled temperature (22 ± 1°C), humidity (55 ± 10%), and 12-hour light/dark cycle. Food and water were available ad libitum. Citric acid monohydrate salt, Dulbecco’s modified Eagle’s medium, ketamine, Escherichia coli lipopolysaccharide, methacholine, penicillin, sodium pentobarbital, streptomycin, suxamethonium, urethane, and xylazine were all obtained from Sigma-Aldrich (Dorset, UK). CP55940, AM251 [N-(piperidin-1-yl)-5-(4-iodophenyl)-1-(2,4-dichlorophenyl)-4-methyl-1H-pyrazole-3-caroxamide], and JTE907 [N-(1,3-benzodioxol-5-ylmethyl)-1,2-dihydro-7-methoxy-2-oxo-8-(pentyloxy)-3-quinolinecarboxamide] were purchased from Tocris Biosciences (Bristol, UK). Recombinant human TNF-α was purchased from First Link (Birmingham, UK). Solutol HS-15 was a gift from BASF (Derby, UK). All other chemicals were purchased from Fisher Scientific (Loughborough, UK). The phytocannabinoids were supplied by GW Pharmaceuticals (London, UK). All solutions were prepared fresh on the day of the experiment. Cannabinoids were dissolved in a solutol HS-15 as a 10% v/v solution of solutol in saline. In cough experiments, a 10-mg/ml solution of a cannabinoid in 10% v/v solutol could be prepared and nebulized without difficulty. Concentrations of solutol greater than 10% v/v were noticeably viscous and did not nebulize effectively. For a detailed description of the methodology, please refer to Makwana et al. (2012a). In brief, guinea pigs were humanely killed by cervical dislocation followed by exsanguination. The tracheae were rapidly removed and immersed into sterile Dulbecco’s modified Eagle’s medium (DMEM) supplemented with 4500 mg/l d-glucose, 110 mg/l sodium pyruvate, and 584 mg/l l-glutamine supplemented with 100 U/ml penicillin and 100 μg/ml streptomycin. The tracheae were subsequently divided into four segments and either used immediately after dissection (fresh) or placed individually in DMEM for culture. Under sterile tissue culture conditions, the tracheal rings were incubated at 37°C in a humidified incubator circulated with 5% CO2 in air for 4 days with either saline or TNF-α (100 ng/ml) in 300 μl of DMEM in 96-well plates. Segments were moved into a new well containing fresh media and TNF-α where appropriate every day. Tracheal smooth muscle contractions were measured in 4-ml organ baths containing Krebs-Henseleit solution (composition in millimolar concentrations: NaCl 118.3, KCl 4.7, MgSO4 1.2, KH2PO4 1.2, NaHCO3 25, d-glucose 11.1, CaCl2 2.5) supplemented with the cyclooxygenase inhibitor indomethacin (10 μM). The Krebs-Henseleit solution was gassed with 95% O2 and 5% CO2 and maintained at 37°C using a previously described method (Makwana et al., 2012a). Tissues were exposed to either a cannabinoid (1 μM) or its vehicle 30 minutes prior to eliciting contractions in response to EFS (1–30 Hz frequency, 5-second trains every 2 minutes at 0.5-millisecond pulse width and a voltage that was 10% greater than the voltage required to elicit maximal contractions) and then to cumulative additions of methacholine. In some experiments, the saline- and TNF-α–incubated tracheal segments were subjected to EFS over the entire duration of the experiment with trains of pulses of 5 Hz frequency for 5 seconds every 100 seconds, 0.5-millisecond pulse width, and 110% voltage. Only one concentration-response curve was constructed for Δ9-THC or CP55940 (0.1 nM to 10 μM) per tissue because these cannabinoids could not be washed from the tissue by renewing the bath with drug-free Krebs-Henseleit solution. When competition studies were performed, AM251 (3 nM), a CB1 receptor antagonist, or JTE907 (30 nM), a CB2 receptor antagonist, was administered 30 minutes prior to the addition of the cannabinoid receptor agonist. All experiments were performed in parallel with relevant vehicle-treated and time controls. A detailed description of the methodology has been published previously (Makwana et al., 2012a). In brief, guinea pigs were exposed to an aerosolized solution of either 10% v/v solutol or 10% v/v solutol containing 10 mg/ml of Δ9-THC, CBD, THCV, CBC, CBDA, or CBG for 20 minutes using an ultrasonic nebulizer (Ultra Neb 99; DeVilbiss, Somerset, PA). Thirty minutes later, the animals were anesthetized with an intramuscular injection of ketamine (40 mg/kg) and xylazine (8 mg/kg) to enable instillation of 50 μl of saline or TNF-α (2 μg) dissolved in 50 μl of saline into the airways using a Hamilton syringe. Six hours after the instillation, the animals were injected with urethane (1.5 g/kg i.p.) to induce surgical anesthesia and instrumented as described previously (Makwana et al., 2012a) for measuring the transpulmonary pressure and calculation of total airway resistance (RL; cm⋅H2O s/l) as an index of airways obstruction. The jugular vein and carotid artery were cannulated for intravenous administration of drug and measurement of mean arterial blood pressure, respectively. Bilateral vagotomy was also performed on all animals to enable the vagi to be threaded through a pair of platinum electrodes for vagal electrical stimulation using a Grass S88 stimulator (Grass Instruments, Rockford, MA). Following stable baseline recording of total lung resistance, heart rate, and mean arterial blood pressure, the vagi were stimulated with 5-second trains every minute at 1- to 30-Hz frequency, 0.5-millisecond pulse width, and 40 V. This was followed by construction of a dose-response curve to intravenous methacholine in the vagotomized animals. Prior to terminating the experiment, the animal was euthanized with an overdose of sodium pentobarbital (65 mg/kg i.v.) and a lavage of the lungs was performed using 5 ml of 0.9% saline. Lipopolysaccharide-Induced Inflammatory Cell Infiltration into the Airways. Guinea pigs were exposed to an aerosolized solution of saline, 10% v/v solutol, or 10% v/v solutol containing either 10 or 50 mg/ml of the phytocannabinoids for 20 minutes. Following a 30-minute rest, the animals were exposed to an aerosolized solution of lipopolysaccharide (LPS; 100 μg/ml) for 20 minutes. Four hours after exposure to LPS, the animals were euthanized with an injection of sodium pentobarbital (1 g/kg i.p.) followed by a bronchoalveolar lavage (BAL) using 5 ml of 0.9% saline. Inflammatory Cell Count in the Lung Lavage Fluid. A 100-μl sample of the lavage fluid from the previous animals was added to an equal volume of 50% v/v Turk’s stain solution for determining the concentration of cells/ml present in the lavage sample using a Neubauer hemocytometer (Fisher Scientific). A differential cell count was performed after using the REASTAIN Quick-Diff (Reagena, Toivala, Finland) stains on cytospins of the lavage fluid to identify the different types of cells present in the lavage fluid as macrophages, neutrophils, and eosinophils. A detailed description of the method for inducing and recording the cough response has been presented elsewhere (Venkatasamy et al., 2010). In brief, guinea pigs were placed individually in Perspex cylindrical exposure chambers (EMKA Technologies, Paris, France) with an airflow of 1.5 l/min and allowed to acclimatize for 10 minutes, during which a baseline recording of the pressure and auditory signals inside the chamber was performed using a differential pressure transducer and a microphone, respectively, connected to a personal computer through an EMKA IOX (version 1.8; EMKA Technologies) data acquisition system. Guinea pigs were exposed for 5 minutes to a mist of 0.3 M citric acid generated by an ultrasonic nebulizer (Ultra-Neb99; Devilbiss) at a rate of 1 ml/min. Coughs were recorded throughout the 5-minute exposure period and thereafter for a further 10 minutes (a total 15-minute period). Animals were removed from the exposure chamber and allowed to recover before being returned to the animal house. Four days after the citric acid exposure, guinea pigs were randomized to receive either aerosolized saline, 10% v/v solutol, or a cannabinoid (10 mg/ml in 10% v/v solutol) for 20 minutes. Twenty minutes later, the animals were placed in the cough-recording chambers, and a baseline record of the pressure and auditory signals was obtained for 10 minutes followed by an exposure for a second time to 0.3 M citric acid for 5 minutes. The coughs were recorded throughout the 5-minute exposure period and a further 10 minutes. Animals were removed from the exposure chamber and allowed to recover before being returned to the animal house. This was repeated 4 days later but with animals crossed over to treatment. Individual agonist concentration-response curves obtained from the organ bath studies in the absence and presence of competing ligands were fitted by nonlinear regression to a four-parameter Hill equation described previously (Makwana et al., 2012a) using GraphPad Prism 5.0 for Windows (GraphPad Software, La Jolla, CA). The concentration-response data were plotted as the mean ± S.E.M. In competition studies, shifts of an agonist concentration-response curve by the presence of a competing ligand, e.g., antagonist, were compared by a one-way analysis of variance (ANOVA) followed by a Dunnett’s post-hoc test for multiple comparisons, or a Student’s unpaired t test for comparisons of individual means as described previously (Makwana et al., 2012a). The concentration ratio for the rightward shift of the agonist concentration-response curve in the presence of a competing ligand was determined as the ratio of concentrations corresponding to the 50% equieffective agonist response level of the curves. The antagonist potency (pA2) was calculated from the Gaddum-Schild equation (Schild, 1949). Data obtained from the lung function experiments were calculated in percentage terms as changes from the baseline value determined immediately prior to administration of an electrical stimulus or spasmogen and reported as the mean ± S.E.M., with n values representing the number of animals used per experiment. For cough experiments, repeated-measures ANOVA (and means tests, two-tailed) were used to test for differences with respect to time, crossover design, repeated measures, and use of the data from the initial screening procedure as a covariate. All other data were analyzed using Student’s unpaired t test for comparisons of individual means. The probability P < 0.05 was taken to be statistically significant. Receptor nomenclature follows the guide to receptors and channels of the International Union of Basic and Clinical Pharmacology and Alexander et al. (2011). Contractions of freshly isolated tracheal rings in the absence of any drug in response to each frequency of EFS and concentration of methacholine were abolished by atropine (1 μM), but only the contractions in response to EFS were sensitive to tetrodotoxin (1 μM). Moreover, the contractions in response to both EFS and methacholine were refractory to hexamethonium (100 μM; Makwana et al., 2012a). 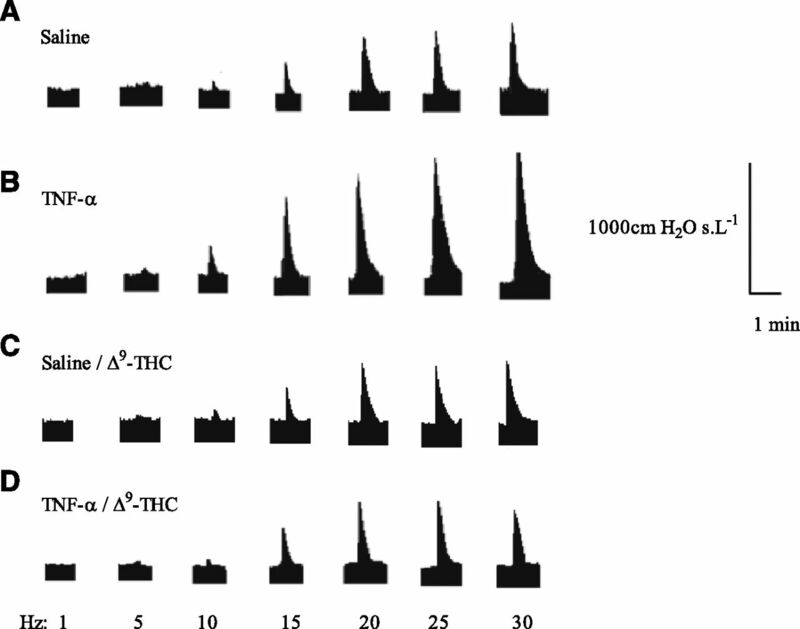 Administration of Δ9-THC, CBD, THCV, CBC, CBDA, CBG, CP55940, AM251, or JTE907 (all at 10 μM) to the freshly isolated tracheal rings did not alter the resting basal tension over a 30-minute period or contractions in response to EFS and methacholine. Fully defined frequency- and concentration-response curves were obtained for EFS and methacholine, respectively, for all segments cultured for 4 days in the presence of saline and TNF-α (100 ng/ml; Fig. 1). There was no significant difference in the maximal contraction or the sensitivity of the saline-incubated and freshly dissected tracheal rings to each frequency of EFS and methacholine (data not shown; see Makwana et al., 2012a). Isometric contractions of the guinea pig–isolated trachea in response to EFS (1–30 Hz) after incubation for 4 days with saline (A) and TNF-α (100 ng/ml) (B) in the presence of vehicle (solutol) (A and B, respectively) and Δ9-THC (10−6 M) (C and D, respectively). EFS parameters: 1-minute trains every 2 minutes at 1–30-Hz frequency, 0.5-millisecond pulse width, and a voltage 10% greater than the voltage required to evoke maximal contractions. However, treatment of the segments for 4 days with TNF-α (100 ng/ml) resulted in significantly larger contractions at each frequency of EFS compared with the contractions of tracheal segments incubated with saline (Figs. 1, A and B, and 2). For example, stimulation at the highest frequency of EFS, i.e., 30 Hz, resulted in significantly larger (130.9 ± 23.5%, P < 0.05, n = 6) contractions of tracheal segments incubated with TNF-α compared with saline. In contrast, the contractions in response to methacholine were not different between the saline and TNF-α treatment (Fig. 2B). Effect of cannabinoids CP55940, Δ9-THC, CBD, CBDA, THCV, CBG, CBC, and Δ9-THC with CBD on contractions of the guinea pig–isolated trachea in response to electrical field stimulation (A) and methacholine (B) following 4 days of incubation with TNF-α (100 ng/ml). The cannabinoids were used at a concentration of 10−6 M. The contractions of the saline-incubated tracheal segments are shown for reference. Each point represents the mean ± S.E.M. (n = 6). *P < 0.05 indicates a significant difference between contractions of the TNF-α–incubated tissue in the absence (◻) and presence of CP55940 (*), Δ9-THC (#), Δ9-THC + CBD (π), and THCV (ϕ). MCh, methacholine. 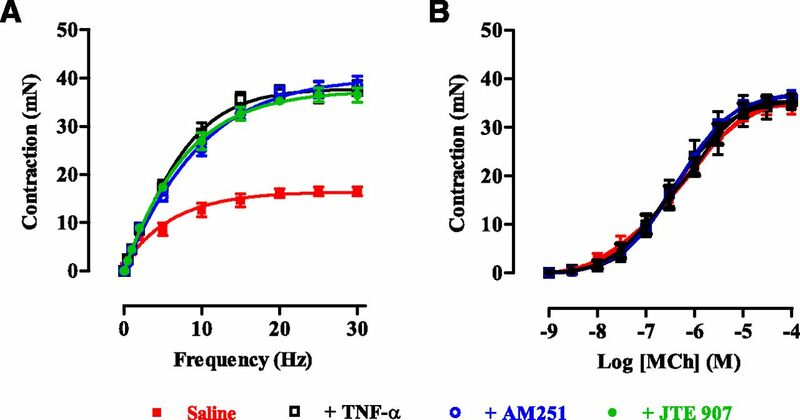 A 30-minute incubation with Δ9-THC, CP55940, or Δ9-THC together with CBD abolished the EFS-evoked contractions augmented by the incubation with TNF-α without causing a change in the amplitude of contractions of saline-treated segments (Fig. 2A). 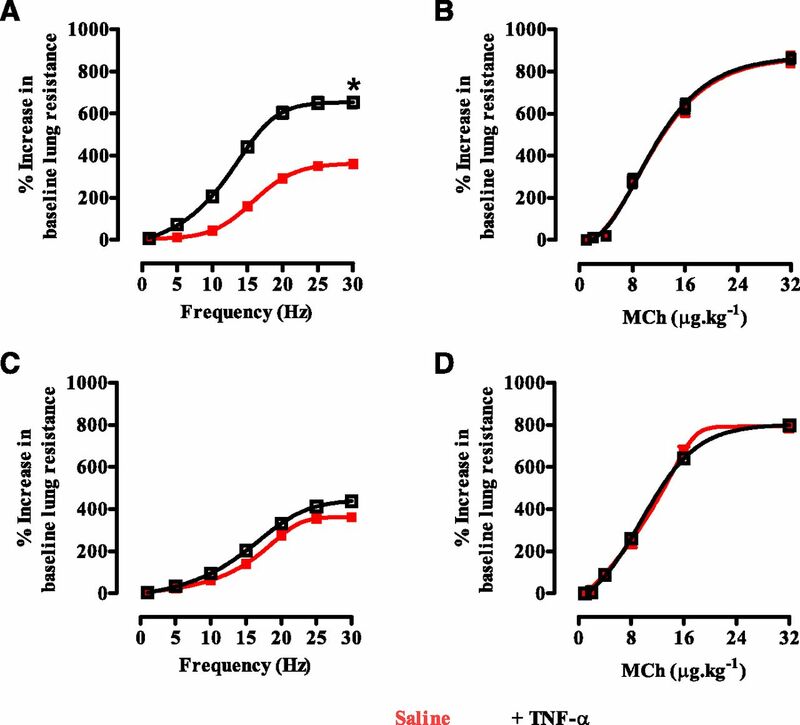 However, the contractions of the saline- or TNF-α–incubated tracheal segments in response to methacholine were not altered by these cannabinoids (Fig. 2B). Figures 1D and 2A show an experimental recording and the data showing the effect of Δ9-THC, respectively. At the highest frequency of EFS, i.e., 30 Hz, THCV caused a partial but significant [19.6 ± 6.1%, P < 0.05 (paired t test), n = 6] inhibition of the TNF-α–augmented EFS-evoked contractions only. THCV did not alter the contractions in response to methacholine. The other phytocannabinoids or selective cannabinoid receptor antagonists were without effect on the contractions of saline- or TNF-α–incubated tracheal segments in response to EFS or methacholine (Figs. 2 and 3). Lack of effect of cannabinoids AM251 (3 × 10−9M) and JTE907 (3 × 10−8 M) on contractions of the guinea pig–isolated trachea in response to electrical field stimulation (A) and methacholine (B) following 4 days of incubation with TNF-α (100 ng/ml) or saline. Each point represents the mean ± S.E.M. (n = 6). MCh, methacholine. Stimulation of tracheal segments incubated for 4 days with saline or TNF-α with trains of EFS pulses of 5-Hz frequency for 5 seconds every 100 seconds resulted in uniform-sized contractions of 8.8 ± 3.1 and 18.6 ± 5.4 mN (n = 6 for each), respectively. Cumulative additions of Δ9-THC (Fig. 4) or CP55940 had no significant effect on the contractions of the tracheal segments incubated with saline, but caused a concentration-related inhibition of the enhanced contractions of the TNF-α–incubated segments to the amplitude of the contractions of the saline-treated segment. Figure 5 shows that the negative logarithm of the concentration of an agonist producing 50% maximal response to that particular agonist (pEC50) values for the inhibition of the TNF-α–augmented contractions by Δ9-THC and CP55940 were 7.7 ± 0.1 and 8.3 ± 0.1, respectively (n = 6 for each). Additionally, both Δ9-THC and CP55940 caused an equivalent maximal inhibition of the TNF-α–potentiated contractions of 86.9 ± 2.7% and 86.2 ± 2.1% (n = 6 for each), respectively. A comparison of the pEC50 values indicated that CP55940 was approximately 4 times more potent (P < 0.05, paired t test) at inhibiting the contractions than Δ9-THC. Representative traces of the EFS-evoked contractions of the guinea pig–isolated trachea in the absence and presence of Δ9-THC. The tracheal rings were previously incubated for 4 days with saline (top) or TNF-α (100 ng/ml, bottom). Note in the bottom trace that the contractions inhibited by Δ9-THC were not restored to the original height in the absence of Δ9-THC by a washout. Atropine (10−6 M) administered at the end of the experiment abolished the contractions of both types of tissues. EFS parameters: 5-second trains every 100 seconds at 5-Hz frequency, 0.5-millisecond pulse width, and a voltage 10% greater than the voltage required to evoke maximal contractions. Concentration-response curves for the inhibition of the EFS-evoked contractions of the guinea pig–isolated trachea incubated for 4 days with TNF-α (100 ng/ml) by Δ9-THC (A) and CP55940 (B) in the presence of ethanol (vehicle), AM251 (3 × 10−9 M), or JTE907 (3 × 10−8 M). EFS parameters: 5-second trains every 100 seconds at 5-Hz frequency, 0.5-millisecond pulse width, and a voltage 10% greater than the voltage required to evoke maximal contractions. Each curve was fitted by nonlinear regression analysis. Each symbol represents the mean value of inhibition of the contractions expressed as a percentage reduction of the amplitude of the contractions measured immediately before the addition of any drug to the organ bath. Vertical lines indicate S.E.M., n = 6 for each curve. AM251 or ethanol was added 20 minutes before the first addition of the agonist. The presence of AM251 (3 nM) or JTE907 (30 nM) caused a significant (P < 0.05, ANOVA and Dunnett’s test) parallel rightward shift of the Δ9-THC and CP55940 concentration-response curves, with no significant (P < 0.05, paired t test) effect on the maximum effect induced by each agonist (Fig. 5). The pA2 values of AM251 for the antagonism of the Δ9-THC– and CP55940-induced inhibition of the TNF-α–potentiated contractions were 8.6 ± 0.3 and 8.5 ± 0.4 (n = 6 for each), respectively. These values were not significantly different against both agonists (P < 0.05, paired t test). The pA2 values of JTE907 for the antagonism of Δ9-THC and CP55940 were 7.6 ± 0.3 and 7.8 ± 0.4 (n = 6 for each), respectively, and these values were not significantly different against both agonists (P < 0.05, paired t test). Neither AM251 (3 nM) nor JTE907 (30 nM) had a significant (P > 0.05, paired t test) effect on the amplitude of the TNF-α–potentiated contractions or contractions of saline-treated segments. Intratracheal instillation of saline or TNF-α into guinea pigs did not result in breathing difficulties or a permanent effect on the baseline total lung resistance to airflow. Additionally, there was no statistically significant difference in the resting mean arterial blood pressure and heart rate between the two treatment groups as observed previously (Makwana et al., 2012a). EFS of the vagus nerves or intravenous administration of methacholine elicited a rapid and transient frequency- and dose-dependent bronchoconstriction in all animals, respectively. The bronchoconstriction in response to vagal EFS was significantly augmented in animals challenged with TNF-α compared with saline (Fig. 6B). For instance, the bronchoconstriction in the TNF-α–treated animals at the highest frequency of EFS, i.e., 30 Hz, was 83.4 ± 11.5% [P < 0.05 (unpaired t test), n = 6] greater than that of saline-challenged animals. Moreover, the frequency of vagal EFS eliciting an increase in total lung resistance by 200% above baseline in the saline- and TNF-α–challenged animals was 15 ± 3 and 9 ± 2 Hz, respectively [P < 0.05 (unpaired t test), n = 6; Fig. 7A]. In contrast to stimulation with EFS, bronchoconstriction in response to methacholine was not different between the vagotomized animals challenged with either saline or TNF-α (Fig. 7B). The bronchoconstriction in response to vagal EFS and methacholine in both saline- and TNF-α–instilled animals was abolished by intravenous administration of atropine (10 μg/kg), as shown previously (Makwana et al., 2012a). Increases in airway lung resistance, as an index of bronchoconstriction, in anesthetized guinea pigs in response to EFS of the vagus nerves 6 hours after intratracheal instillation of saline (A) and TNF-α (2 μg) (B) and a 20-minute aerosol pre-exposure with 10% solutol (A and B) or Δ9-THC (10 mg/ml) (C and D). EFS parameters: 5-second trains every minute at 1–30-Hz frequency, 0.5-millisecond pulse width, and a voltage 10% greater than the voltage required to evoke maximal bronchoconstriction. Increases in airway resistance of anesthetized guinea pigs in response to vagal EFS and methacholine 6 hours after intratracheal instillation of either saline (▪) or 2 μg human TNF-α (□). Each guinea pig was previously exposed to an aerosolized solution of 10% solutol (A and B) or Δ9-THC (10 mg/ml) (C and D) for 20 minutes. Each point represents the mean ± S.E.M. (n = 6). *P < 0.05 indicates a significant difference between the bronchoconstriction of the saline- and TNF-α–treated animals in response to vagal EFS at 30 Hz. MCh, methacholine. The bronchoconstrictor response of the Δ9-THC–exposed, saline-challenged animals in response to vagal EFS or intravenous methacholine was not different from that of solutol-exposed, saline-treated control animals (Figs. 6, A and C, and 7B). However, the enhanced bronchoconstriction of animals exposed to TNF-α in response to vagal stimulation was abolished by Δ9-THC (Figs. 6D and 7C). None of the phytocannabinoids, including Δ9-THC or a combination of Δ9-THC and CBD, significantly altered bronchoconstriction in response to methacholine in animals treated with TNF-α (Fig. 7D; Supplemental Table A). Cell Count in the Lavage Fluid 6 Hours Post–Intratracheal Administration of TNF-α In Vivo. A total of 47.6 ± 4.2 × 104 and 86.0 ± 9.6 × 104 leukocytes/ml (P < 0.05, n = 6) were present in the BAL fluid recovered from guinea pigs instilled with saline or TNF-α, respectively (Fig. 8). These data indicated that exposure to TNF-α resulted in an 84.3% (P < 0.05, n = 6) increase in cell recruitment to the lungs. A differential cell count showed that the greater total number of cells in the in BAL fluid of animals exposed to TNF-α was attributed to an increase of 18.0 ± 2.9 × 104 neutrophils/ml. Eosinophils were largely absent from the BAL fluid obtained from either saline- or TNF-α–exposed animals. Exposure to Δ9-THC caused a significant 84 and 82% [P < 0.05 (unpaired t test), n = 6] inhibition of the TNF-α–induced migration of total leukocytes and neutrophils, respectively, into the lungs without affecting [P > 0.05 (unpaired t test), n = 6] the numbers of these cells in animals exposed to saline. Exposure to aerosolized cannabinoid significantly reduced neutrophil recruitment to the airways (treatment × stimulus interaction F[6,70] = 3.576, P = 0.004). This was reflected by a significant suppression (mean difference versus solutol treatment, 95% confidence interval) of neutrophil migration (cells/ml) in Δ9-THC– [17 (7.3–26.7) × 104, P < 0.05], CBG- [14 (4.3–23.7) × 104, P < 0.05], and CBC-treated animals [12 (2.3–21.7) × 104, P = 0.05]. In terms of percentage inhibition, this amounted to a 70 ± 8%, 58 ± 10%, and 50 ± 9% (n = 6 per group) reduction (Table 1) compared with mean neutrophil numbers in solutol-treated animals. Although THCV and CBDA caused a decrease in cell number (37 ± 12% and 39 ± 15%, respectively) compared with solutol-treated animals, this did not achieve statistical significance [9.2 (−0.5–18.8) × 104, P > 0.05; 9.5 (−0.185–19.2) × 104, P > 0.05]. The combination of Δ9-THC with CBD did not result in an inhibitory effect different from that achieved with Δ9-THC alone. Total (A) and differential (B) count of the leukocytes (cells × 104/ml) in the lumen of the guinea pig airways 6 hours after intratracheal instillation of either 50 μl of saline (□) or 2 μg of human TNF-α (◼) following 20-minute aerosol of 10% solutol. In (B), m, n, and e represent monocytes, neutrophils, and eosinophils, respectively, whereas S and T represent saline and TNF-α treatment, respectively. *Significant difference (P < 0.05) relative to the corresponding saline-treated (□) animal bar. Each point represents the mean ± S.E.M (n = 6). Comparison of the effect of cannabinoids on the increases in total count of leukocytes and neutrophils (cells × 104/ml) in the lavage fluid from guinea pig lungs 6 hours after intratracheal instillation of either 50 μl of saline or 2 μg of human TNF-α. Each animal was exposed to an aerosolized solution of either a cannabinoid (10 mg/ml) or its vehicle, solutol, for 20 minutes 1 hour before the intratracheal challenge with saline or TNF-α. Each value represents the mean ± S.E.M. (n = 6). Cell Count in the Lavage Fluid 4 Hours Post–Aerosol Administration of LPS In Vivo. A total of 61.1 ± 10.0 × 104 and 200.9 ± 12.6 × 104 leukocytes/ml (P < 0.001, n = 14 and 29, respectively) were present in the BAL fluid recovered from guinea pigs exposed to saline and LPS, respectively. A differential cell count showed that the increase in the total number of leukocytes was predominantly attributed to 153.3 ± 10.9 × 104 neutrophils/ml in the BAL fluid (P < 0.001) and represented 75 ± 4% of the total cell count in LPS-treated guinea pigs (Supplemental Table B). THCV (50 mg/kg) attenuated the recruitment of neutrophils to the lung with a mean difference of 68.4 ± 23.9 × 104 leukocytes/ml and amounting to a 42 ± 12% decrease in cell recruitment (P = 0.035). The remaining cannabinoids caused a 10–30% reduction in neutrophil recruitment to the airways, but this did not achieve statistical significance (Supplemental Table B). Exposure to aerosolized citric acid immediately provoked powerful coughs that were observed as sudden transient changes in the exposure chamber pressure (Supplemental Fig. A). An average of 27 ± 2 coughs (n = 62) were recorded during the 15-minute recording period. We have previously shown that a reproducible number of cough responses are produced by three consecutive citric acid challenges spaced 4 days apart with no statistical difference between the time points (Venkatasamy et al., 2010). Treatment with aerosolized saline or solutol did not result in a significant difference in the number of citric acid–induced coughs compared with those recorded 4 days earlier in the absence of these vehicles (Fig. 9A; Table 2). Moreover, there was no statistical difference in the number of coughs in the sequence in which the treatments were given. The number of coughs in response to aerosolized citric acid over a 15-minute duration following an exposure to solutol (10% in saline) (A), Δ9-THC (10 mg/ml) (B), CBD (10 mg/ml) (C), and Δ9-THC and CBD together (both at 10 mg/ml) (D) for 20 minutes and a 30-minute rest period. Vertical lines indicate the mean ± S.E.M (n = 8). *Significant difference (P < 0.05) compared with solutol treatment. Each animal was initially exposed to aerosolized citric acid (0.3 M) for 15 minutes to determine the number of coughs elicited in the absence of test substances (screen). After 4 days, half of the animals in a group were either exposed to an aerosolized cannabinoid (10 mg/ml) or its vehicle, solutol, for 20 minutes. Thirty minutes later, the animals were challenged with citric acid (0.3 M) and the number of coughs was counted. This was repeated 4 days later but with animals crossed over to treatment. Each value represents the mean ± S.E.M. (n = 8 animals). Cough in response to citric acid was measured in eight animals randomized to receive either 10% solutol or Δ9-THC (10 mg/ml). Δ9-THC significantly inhibited the cough response compared with exposure to solutol in seven out of eight animals. A comparison of the mean number of coughs for the entire group of animals indicated that Δ9-THC caused a 68.7% decrease in the number of coughs compared with solutol (Fig. 9B; Table 2). The mean difference (± S.E.M.) between solutol- and Δ9-THC–treated animals was 12.2 ± 3.8 coughs (df = 9, P < 0.05), or a mean (confidence interval) of 12 coughs (2.8–22). In animals exposed to Δ9-THC first, the antitussive effect did not influence the coughing following exposure to solutol 4 days later. CBD significantly (P < 0.05) suppressed cough in only three out of eight animals. Nevertheless, a t test analysis on the total mean number of coughs of all CBD- versus solutol-exposed animals indicated that CBD had no significant effect compared with solutol (Fig. 9C; Table 2). For the three out of eight animals that responded to CBD, the mean difference (± S.E.M.) between solutol- and CBD-treated animals was 26.0 ± 1.8 coughs (df = 4, P = 0.0182), or a mean (confidence interval) of 24 coughs (19.4–32.5). An exposure to equivalent concentrations of 10 mg/ml of both Δ9-THC and CBD produced a significant (P < 0.05) inhibitory effect on the cough response (Fig. 9D; Table 2). Although the 46.7% inhibition did not appear significantly different in magnitude from that caused by Δ9-THC alone, further analysis of these data taking into account sequence, period, and treatment effects, and using baseline screen as a covariate indicated a significant effect. The mean difference (± S.E.M.) between solutol- and the combined Δ9-THC and CBD–treated animals was 18.0 ± 3.6 coughs (df = 6, P = 0.0182), a mean (confidence interval) of 18 coughs (9–27). Therefore, at present, it cannot be concluded that the combination treatment did not cause a superior effect to Δ9-THC alone as the effect of lower doses of these substances was not tested. The citric acid–induced cough response was refractory to treatment with THCV, CBG, CBDA, and CBC (Table 2). A range of cannabinoids at concentrations that elicit a robust effect in most isolated tissue bioassays (Izzo et al., 2009; Pertwee et al., 2010; Russo, 2011) did not alter baseline tension of airway smooth muscle or contraction induced by EFS or methacholine. Hence, these cannabinoids lack bronchodilator activity, suggesting that cognate receptors were either absent or poorly coupled to their effector pathways in airway smooth muscle. Similarly, CP55940 does not alter basal muscle tone, relax acetylcholine (ACh) precontracted trachea, or modulate EFS-evoked contractions in this preparation, consistent with a lack of [3H]CP55940 binding sites (Spicuzza et al., 2000). However, these receptors might be localized to other cell types. For example, localization of CB1 receptors has been observed on nerve fibers distributed among bronchial and bronchiolar smooth muscle cells where axons are packed together into glial capsules (Calignano et al., 2000). Recently, human bronchial tissue was found to express CB1 receptors that were functionally coupled to inhibition of EFS-evoked cholinergic contractions, but not basal tone (Grassin-Delyle et al., 2014). TNF-α potentiated contraction in response to EFS but not methacholine, as a result of an enhanced release of ACh from postganglionic nerves rather than an increased potency of ACh at the smooth muscle M3 muscarinic receptors (Makwana et al., 2012a). This potentiation of the EFS-evoked contraction was abolished by Δ9-THC, CP55940, and Δ9-THC combined with CBD, but only partially attenuated by THCV. The other cannabinoids were without effect. Our findings point to a presynaptic inhibition of ACh release from postganglionic nerve terminals and not antagonism of postjunctional muscarinic M3 receptors. Emerging evidence suggests that synergy exists between the activities of different cannabinoids, encompassing a potentiation or antagonism of the beneficial or adverse effects of one phytocannabinoid by another. For example, despite having negligible affinity, CBD antagonizes cannabinoid receptors to modulate Δ9-THC–associated adverse events such as anxiety, tachycardia, hunger, and sedation in rats and humans (Nicholson et al., 2004; Murillo-Rodriguez et al., 2006). However, we did not find any evidence of such an interaction in the guinea pig trachea. The inhibitory effect of Δ9-THC and CP55940 on TNF-α–potentiated EFS-evoked contractions was equal in magnitude, and their pEC50 and rank order of potency were consistent with those reported at guinea pig, human, mouse, and rat CB1 and CB2 receptors in other bioassays (Pertwee et al., 1996; Pertwee and Fernando, 1996; Makwana et al., 2010). That AM251 and JTE907 produced an agonist-independent, parallel, and surmountable dextral shift of the Δ9-THC and CP55940 concentration-response curve with pA2 values within the range of pKB/pKi values of AM251 at the CB1 receptor (8.12–8.57; Pertwee, 2005) and JTE907 at the CB2 receptor (7.21–7.44; Iwamura et al., 2001; Marini et al., 2013) revealed that both agonists were full agonists at these receptors, and their interaction with the antagonists was simple competition. The mechanism for the selective inhibition of the EFS-evoked contractions of TNF-α–incubated trachea by Δ9-THC and CP55940 is not clear. Perhaps exposure to TNF-α induced or enhanced the expression and stimulus-response coupling capacity of cannabinoid receptors at postganglionic nerve terminals. By elevating receptor density to create a receptor reserve or enhancing intracellular signaling, the efficacy to an agonist would be increased. Induction of receptor expression, upregulation, and functional effects of both cannabinoid receptor subtypes has been shown to occur in response to inflammatory insults in the intestinal tract (Izzo et al., 2000; Duncan et al., 2008). In addition to their antagonist activity, AM251 and JTE907 can elicit effects that are invariably opposite in direction compared with those produced by agonists acting at their respective cannabinoid receptor (Iwamura et al., 2001; Marini et al., 2013). Such effects occur through the unmasking of constitutive receptor activity via inverse agonism, or the antagonism of tonically released endocannabinoid agonists at the receptors. Neither antagonist potentiated the effect of TNF-α on EFS-evoked contractions, suggesting the absence of a constitutive cannabinoid receptor activity or inadequate endocannabinoid agonist stimulation (Jia et al., 2002). The modest inhibition afforded by THCV was not examined further. Whether this occurred through partial agonism at both cannabinoid receptors is unknown given its protean activity, i.e., the ability to concurrently display agonist and antagonist activity at the same receptors depending on the intracellular effector pathways or tissue used (Pertwee et al., 2007; Thomas et al., 2007; Pertwee, 2008). Intratracheal instillation of TNF-α into guinea pigs potentiated the bronchoconstriction in response to vagal stimulation but not methacholine (Makwana et al., 2012a). Only Δ9-THC and Δ9-THC combined with CBD attenuated this enhanced response to vagal stimulation, whereas none of the cannabinoids altered methacholine-evoked bronchoconstriction in the vagotomized guinea pigs. The absence of an interaction between Δ9-THC and CBD observed on the isolated trachea was confirmed in vivo. THCV also lacked inhibitory activity in vivo. 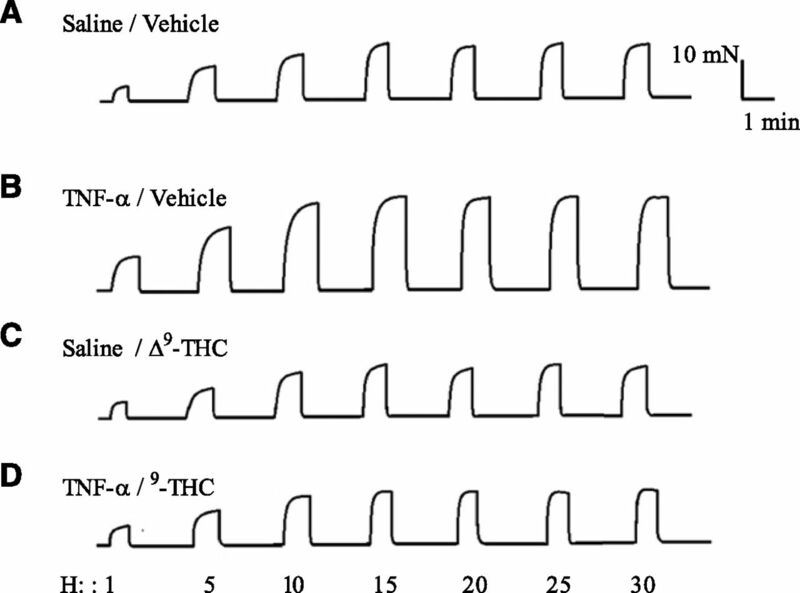 Bradycardia and hypotension induced by vagal stimulation or methacholine were refractory to TNF-α or cannabinoid treatment, implying a localized pulmonary site of action. We have confirmed that TNF-α induced an airway neutrophilia that is known to be dependent on the release of chemokines, such as interleukin-8, and expression of adhesion molecules on pulmonary endothelium and leukocytes (Horgan et al., 1993; Kuo et al., 1997). Only Δ9-THC inhibited this response, an effect suggestive of CB2 receptor action (Galiegue et al., 1995; Ihenetu et al., 2003). We also confirmed that LPS was able to induce a pulmonary neutrophilia, but in contrast, this was more refractory to the actions of cannabinoids as only THCV produced a significant inhibitory effect. The pulmonary inflammation induced by LPS involves both TNF-α–dependent and –independent mechanisms (Smith et al., 1998; Schnyder-Candrian et al., 2005) and activation of multiple signaling pathways (Nick et al., 1999; De Stefano et al., 2013). Activation of different inflammatory pathways by TNF-α and LPS is a likely explanation for the differences we have observed in the anti-inflammatory actions of the phytocannabinoids in these experiments. The effect of phytocannabinoids on various indices of the inflammatory response has been investigated. For example, paw edema following exposure to LPS is suppressed by Δ9-THC (CB1 receptor–dependent) and CBC (CB1 and CB2 receptor–independent) (DeLong et al., 2010), and cell migration was attenuated in CB1 receptor knockout mice (Marquart et al., 2010). 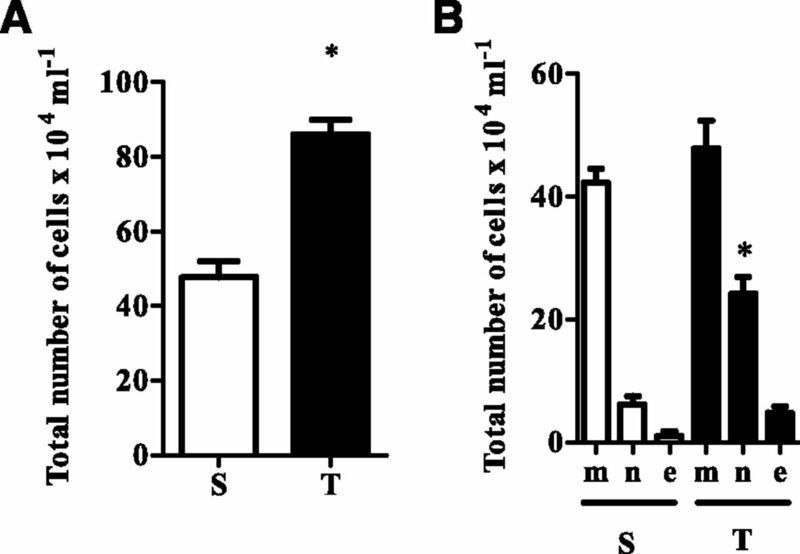 Δ9-THC and CBD appear to suppress myeloperoxidase activity in rat colon following an inflammatory stimulus (Jamontt et al., 2010; Schicho and Storr, 2012) and decrease neutrophil recruitment to the airways in acute lung injury (Ribeiro et al., 2012). THCV suppressed paw edema due to carrageenan that was reversed by antagonism of CB2 receptors, although the effect of this cannabinoid on inflammatory cell recruitment was not investigated (Bolognini et al., 2010). The phytocannabinoids used in this study can also activate non–CB1 and CB2 receptor–dependent pathways, including TRPV1 and TRPA1 (De Petrocellis et al., 2011). However, the genetic ablation of TRPV1 appears to either promote (Helyes et al., 2007; Wang and Wang, 2013) or suppress (Szitter et al., 2010) neutrophilic inflammation, whereas genetic ablation of TRPA1 was without effect (Bonet et al., 2013; Meseguer et al., 2014), suggesting a very complex interaction of mechanisms. Citric acid evokes cough in guinea pigs via stimulation of acid-sensing ion channels and TRPV1 receptors on bronchopulmonary vagal afferent Aδ and C-fibers (Watanabe et al., 2006; Kollarik et al., 2007). Δ9-THC suppressed the tussive effect of citric acid, consistent with an earlier study documenting inhibition of cough elicited by EFS of the laryngeal nerve and mechanical stimulation of the trachea (Gordon et al., 1976). The absence of [3H]CP55940 binding in the rat brain stem (Herkenham et al., 1990; Mailleux and Vanderhaeghen, 1992), the localization of CB1 receptors in the airways that have been implicated in the antitussive action of anandamide (Calignano et al., 2000), the lack of respiratory depression, and low lethality of a cannabis overdose in humans (Iversen, 2000; Howlett et al., 2002) may point to a peripheral locus of antitussive action of Δ9-THC. However, the recent demonstration of functional CB1 receptors in the brain stem suggests that a centrally mediated antitussive action of Δ9-THC is also possible (Fawley et al., 2014). Additionally, JWH133 [(6aR,10aR)-3-(1,1-dimethylbutyl)-6a,7,10,10a-tetrahydro-6,6,9-trimethyl-6H-dibenzo[b,d]pyran] inhibited depolarization of the guinea pig and human vagus nerve evoked by hypertonic saline, capsaicin, and prostaglandin E2 through CB2 receptor activation, and inhibited citric acid–induced cough in guinea pigs following systemic administration (Patel et al., 2003). Therefore, a possible peripheral CB2 receptor–mediated antitussive effect of Δ9-THC is plausible. The presence of CB2 receptors in the rat brain stem and their functional control of emesis (van Sickle et al., 2005) suggest that brain stem CB2 receptors may also modulate the cough reflex and could serve as a nonpsychotropic cannabinoid target for treating cough. Thus, to date, the precise location of antitussive action of Δ9-THC remains to be established. Other phytocannabinoids evaluated for antitussive activity were not effective at the dose studied. However, despite having negligible affinity for CB1 and CB2 receptors, these cannabinoids can exhibit pharmacological activity through the modulation of certain other receptor types implicated in cough, e.g., TRPV1, serotonin 5HT3 (Pertwee, 2008; Izzo et al., 2009). Furthermore, the phytocannabinoids CBC, CBD, and CBDA can activate TRPV1 (Pertwee, 2008; Izzo et al., 2009). However, the lack of effect of these cannabinoids on the citric acid–induced cough could be attributed to their low affinity, potency, or poor receptor-stimulus coupling capacity. The similar antitussive effect of Δ9-THC compared with that of Δ9-THC and CBD together was indicative of a lack of interaction between these cannabinoids on the cough reflex. Taken together, only Δ9-THC attenuated the TNF-α–augmented neuronal cholinergic transmission via activation of CB1 and CB2 receptors and possessed modest inflammatory and antitussive activity suggestive of a broad range of beneficial pharmacological effects of this cannabinoid in the airways. Participated in research design: Makwana, Spina, Page. Contributed new reagents or analytic tools: Page. Performed data analysis: Makwana, Spina. Wrote or contributed to the writing of the manuscript: Makwana, Spina, Page. This work was supported by GW Pharmaceuticals. (2011). Guide to receptors and channels (GRAC), 5th edition. Br J Pharmacol 164:1–324. (2000) Bidirectional control of airway responsiveness by endogenous cannabinoids. Nature 408:96–101. (2010) The plant cannabinoid Delta9-tetrahydrocannabivarin can decrease signs of inflammation and inflammatory pain in mice. Br J Pharmacol 160:677–687. (2013) The role of transient receptor potential A 1 (TRPA1) in the development and maintenance of carrageenan-induced hyperalgesia. Neuropharmacology 65:206–212. (2010) Pharmacological evaluation of the natural constituent of Cannabis sativa, cannabichromene and its modulation by Δ(9)-tetrahydrocannabinol. Drug Alcohol Depend 112:126–133. (2011) Effects of cannabinoids and cannabinoid-enriched Cannabis extracts on TRP channels and endocannabinoid metabolic enzymes. Br J Pharmacol 163:1479–1494. (2013) A decoy oligonucleotide to NF-κB delivered through inhalable particles prevents LPS-induced rat airway inflammation. Am J Respir Cell Mol Biol 49:288–295. (2001) The role of nerve factor - induced airway hyperesponsiveness to histamine in guinea-pigs. Br J Pharmacol 134:771776. (2008) Cannabinoid CB2 receptors in the enteric nervous system modulate gastrointestinal contractility in lipopolysaccharide-treated rats. Am J Physiol Gastrointest Liver Physiol 295:G78–G87. (2014) Cannabinoid 1 and transient receptor potential vanilloid 1 receptors discretely modulate evoked glutamate separately from spontaneous glutamate transmission. J Neurosci 34:8324–8332. (2010) The cannabinoid receptor agonist WIN 55,212-2 inhibits antigen-induced plasma extravasation in guinea pig airways. Int Arch Allergy Immunol 152:295–300. (1976) Antitussive activity of some naturally occurring cannabinoids in anesthetized cats. Eur J Pharmacol 35:309–313. (2014) Cannabinoids inhibit cholinergic contraction in human airways through prejunctional CB1 receptors. Br J Pharmacol 171:2767–2777. (1978) Bronchodilator effect of delta1-tetrahydrocannabinol. Br J Clin Pharmacol 5:523–525. (2007) Role of transient receptor potential vanilloid 1 receptors in endotoxin-induced airway inflammation in the mouse. Am J Physiol Lung Cell Mol Physiol 292:L1173–L1181. (1990) Cannabinoid receptor localization in brain. Proc Natl Acad Sci USA 87:1932–1936. (1993) TNF-alpha release in endotoxemia contributes to neutrophil-dependent pulmonary edema. Am J Physiol 264:H1161–H1165. (2002) International Union of Pharmacology. XXVII. Classification of cannabinoid receptors. Pharmacol Rev 54:161–202. (2003) Pharmacological characterisation of cannabinoid receptors inhibiting interleukin 2 release from human peripheral blood mononuclear cells. Eur J Pharmacol 464:207–215. (2000) Marijuana and medicine, Oxford University Press, New York. (2001) In vitro and in vivo pharmacological characterization of JTE-907, a novel selective ligand for cannabinoid CB2 receptor. J Pharmacol Exp Ther 296:420–425. (2009) Non-psychotropic plant cannabinoids: new therapeutic opportunities from an ancient herb. Trends Pharmacol Sci 30:515–527. (2000) Central and peripheral cannabinoid modulation of gastrointestinal transit in physiological states or during the diarrhoea induced by croton oil. Br J Pharmacol 129:1627–1632. (2010) The effects of Delta-tetrahydrocannabinol and cannabidiol alone and in combination on damage, inflammation and in vitro motility disturbances in rat colitis. Br J Pharmacol 160:712–723. (2003) Attenuation of the ovalbumin-induced allergic airway response by cannabinoid treatment in A/J mice. Toxicol Appl Pharmacol 188:24–35. (2002) Anandamide induces cough in conscious guinea-pigs through VR1 receptors. Br J Pharmacol 137:831–836. (2007) Acid-sensitive vagal sensory pathways and cough. Pulm Pharmacol Ther 20:402–411. (1997) Effect of endogenous nitric oxide on tumour necrosis factor-alpha-induced leukosequestration and IL-8 release in guinea-pigs airways in vivo. Br J Pharmacol 122:103–111. (2010) Pharmacological characterization of cannabinoid receptor activity in the rat-isolated ileum myenteric plexus-longitudinal muscle preparation. Br J Pharmacol 159:1608–1622. (2012a) TNF-α-induces airway hyperresponsiveness to cholinergic stimulation in guinea pig airways. Br J Pharmacol 165:1978–1991. (2012b) Cannabinoid receptor activity in the tumour necrosis factor (TNF)-α-induced increased contractility of the guinea-pig isolated trachea. Proceedings of the American Thoracic Society Meeting 2012; 2012 May 18–23; San Francisco, CA. Abstract No. A2154. (2013) Characterization of cannabinoid receptor ligands in tissues natively expressing cannabinoid CB2 receptors. Br J Pharmacol 169:887–899. (2010) Inactivation of the cannabinoid receptor CB1 prevents leukocyte infiltration and experimental fibrosis. Arthritis Rheum 62:3467–3476. (2003) Antitussive effect of WIN 55212-2, a cannabinoid receptor agonist. Eur J Pharmacol 474:269–272. (2006) Cannabidiol, a constituent of Cannabis sativa, modulates sleep in rats. FEBS Lett 580:4337–4345. (2004) Effect of Delta-9-tetrahydrocannabinol and cannabidiol on nocturnal sleep and early-morning behavior in young adults. J Clin Psychopharmacol 24:305–313. (1999) Selective activation and functional significance of p38alpha mitogen-activated protein kinase in lipopolysaccharide-stimulated neutrophils. J Clin Invest 103:851–858. (1842) On the preparations of the Indian hemp, or gunjah, (cannabis indica) and their effects on the animal system in health and their utility in the treatment of tetanus and other convulsive disorders. Trans Med and Phy Soc Calcutta 8:421–461. (2003) Inhibition of guinea-pig and human sensory nerve activity and the cough reflex in guinea-pigs by cannabinoid (CB2) receptor activation. Br J Pharmacol 140:261–268. , editor (2005) Pharmacological actions of cannabinoids, in Handbook of Experimental Pharmacology: Cannabinoids, pp 1–51, Springer-Verlag, Berlin. (2008) The diverse CB1 and CB2 receptor pharmacology of three plant cannabinoids: Δ9-tetrahydrocannabinol, cannabidiol and Δ9-tetrahydrocannabivarin. Br J Pharmacol 153:199–215. (1996) Evidence for the presence of cannabinoid CB1 receptors in mouse urinary bladder. Br J Pharmacol 118:2053–2058. (1996) Further evidence for the presence of cannabinoid CB1 receptors in guinea-pig small intestine. Br J Pharmacol 118:2199–2205. (2010) International Union of Basic and Clinical Pharmacology. LXXIX. Cannabinoid receptors and their ligands: beyond CB₁ and CB₂. Pharmacol Rev 62:588–631. (2007) The psychoactive plant cannabinoid, Delta9-tetrahydrocannabinol, is antagonized by Delta8- and Delta9-tetrahydrocannabivarin in mice in vivo. Br J Pharmacol 150:586–594. (2012) Cannabidiol, a non-psychotropic plant-derived cannabinoid, decreases inflammation in a murine model of acute lung injury: role for the adenosine A(2A) receptor. Eur J Pharmacol 678:78–85. (2011) Taming THC: potential cannabis synergy and phytocannabinoid-terpenoid entourage effects. Br J Pharmacol 163:1344–1364. (2012) Topical and systemic cannabidiol improves trinitrobenzene sulfonic acid colitis in mice. Pharmacology 89:149–155. (1949) pAx and competitive drug antagonism. Br Pharmacol Chemother 4:277–280. (2005) Dual effects of p38 MAPK on TNF-dependent bronchoconstriction and TNF-independent neutrophil recruitment in lipopolysaccharide-induced acute respiratory distress syndrome. J Immunol 175:262–269. (1977) Tetrahydrocannabinol as a bronchodilator. Why bother. Chest 71:558–560. (1998) The locus of tumor necrosis factor-alpha action in lung inflammation. Am J Respir Cell Mol Biol 19:881–891. (2000) Characterization of the effects of cannabinoids on guinea-pig tracheal smooth muscle tone: role in the modulation of acetylcholine release from parasympathetic nerves. Br J Pharmacol 130:1720–1726. (2010) The role of transient receptor potential vanilloid 1 (TRPV1) receptors in dextran sulfate-induced colitis in mice. J Mol Neurosci 42:80–88. (1977) Bronchial effects of aerosolized delta 9-tetrahydrocannabinol in healthy and asthmatic subjects. Am Rev Respir Dis 115:57–65. (1974) Acute effects of smoked marijuana and oral delta9-tetrahydrocannabinol on specific airway conductance in asthmatic subjects. Am Rev Respir Dis 109:420–428. (1975) Effects of smoked marijuana in experimentally induced asthma. Am Rev Respir Dis 112:377–386. (1973) Single-dose effects of marihuana smoke. Bronchial dynamics and respiratory-center sensitivity in normal subjects. N Engl J Med 288:985–989. (1997) Marijuana. Respiratory tract effects. Clin Rev Allergy Immunol 15:243–269. (2005) Identification and functional characterization of brainstem cannabinoid CB2 receptors. Science 310:329–332. (2010) Use of within-group designs to test anti-tussive drugs in conscious guinea-pigs. J Pharmacol Toxicol Methods 61:157–162. (2013) TRPV1 ablation aggravates inflammatory responses and organ damage during endotoxic shock. Clin Vaccine Immunol 20:1008–1015. (2006) Immunohistochemical co-localization of transient receptor potential vanilloid (TRPV)1 and sensory neuropeptides in the guinea-pig respiratory system. Neuroscience 141:1533–1543. (1976) Bronchodilator effect of delta1-tetrahydrocannabinol administered by aerosol of asthmatic patients. Thorax 31:720–723. (2005a) Endogenous cannabinoid receptor agonists inhibit neurogenic inflammations in guinea pig airways. Int Arch Allergy Immunol 138:80–87. (2005b) The cannabinoid receptor agonist WIN 55212-2 inhibits neurogenic inflammations in airway tissues. J Pharmacol Sci 98:77–82. (2004) Cannabinoid receptor agonists inhibit sensory nerve activation in guinea pig airways. Am J Respir Crit Care Med 170:941–946. (1999) Inhibitory effects of cannabinoid receptor ligands on electrically-evoked responses in rat isolated tracheal ring segments. Pharmacol Res 40:415–421.